How to Deposit and Withdraw From Alertpay. It is necessary for withdrawal from Alertpay that you must have $20 in your Alertpay account. It is better to have an account in Standard Chartered Bank because there online banking is absolutely free. You can easily open BBA account with SCB in just rs.1000/- and also apply for debit card. Debit card charges are rs.580. Debit card issued in 3-4 days. You have to activate your debit card in your Alertpay account. 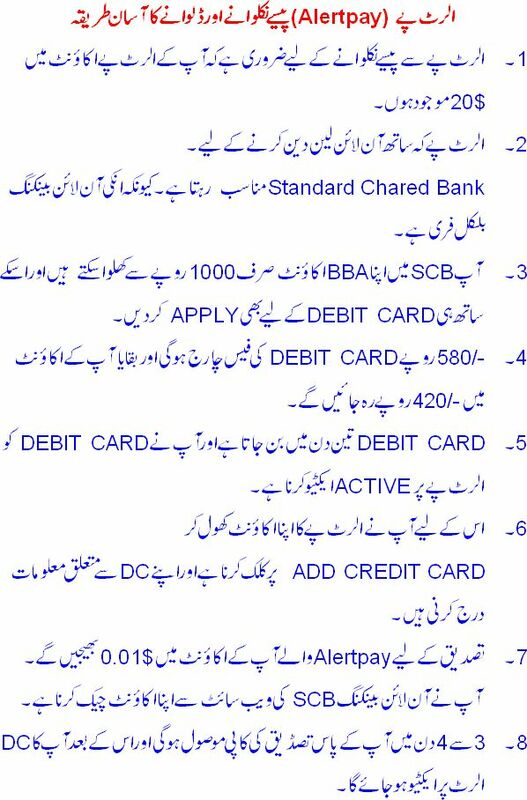 For adding debit card in Alertpay you have to login in Alertpay account then choose Add Credit Card option and give all Debit card information in the given form. For bank account verification Alertpay send you $0.01 in your SCB account. You can check this transaction through internet banking. It will take 3-4 business days you to receive $.0.01 in SCB account. You will also received a code no. you have to put that code in alertpay account to activate debit card in your AP. If you want to send amount from your AP to bank account open AP account then click on withdraw and select Via Credit Card option. Then give your DC details then click confirm to complete your transaction. That’s the simple way of transaction from AP to BA. Remember that it will take 3-4 days you to receive that amount in your BA. AP fess is $5 for each transaction. When you received the amount check online or through ATM your bank account balance for your satisfaction. 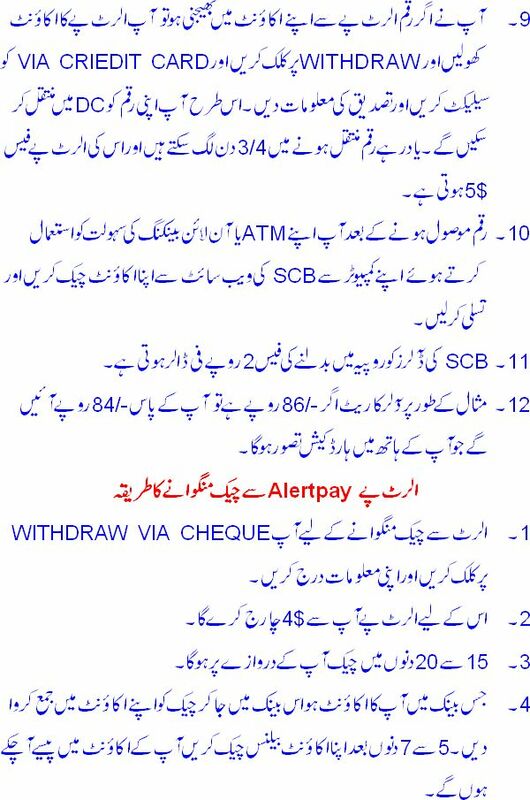 The fees of SCB for USD conversion to PKR is Rs.2/-. For instance if the rate of USD is Rs.86 you will receive Rs.84 for a $. Which you consider a hard cash in hand. You can also request a check from AP. For this, you have click on Withdraw Via Check option and give all information required there. AP charges for check transaction are $4. You will receive check in your home in 15-20 days. You can deposit the check in your bank account in any bank. 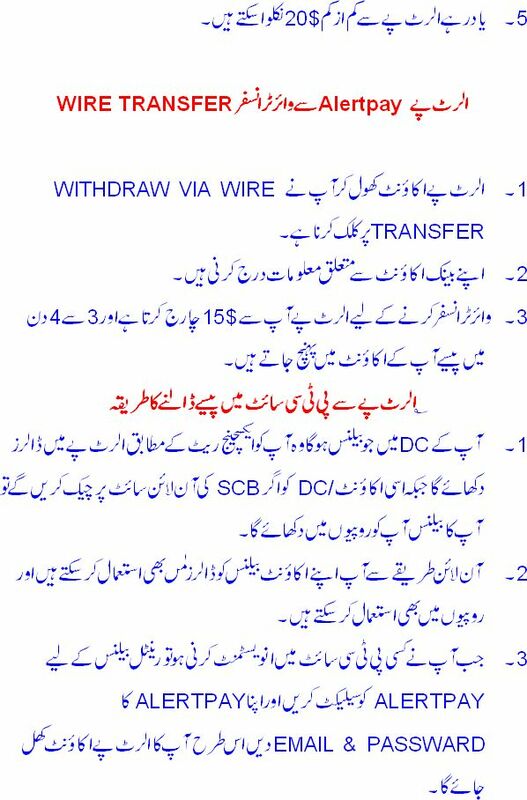 In 5-7 days amount will be transferred in your bank account. 3. Transaction through Wire Transfer. If you want money via wire transfer. Click on withdraw via wire transfer option. Give all required bank account information there. Wire transfer charges of AP are 15$. In 3-4 days amount will be transferred in your account. 4. Transferring amount from AP to PTC site. You can use your SCB account balance as USD through online banking. If you want to invest in PTC site you have to add amount in your rental balance. For that click on rental balance then choose AP method. Give your AP email and password. You are now logged in your AP account. Once you logged in click on Credit Card and then upload the required money from your DC to rental balance.